First, let us consider what the Lord spoke of them, through both Zechariah and the apostle John. Zechariah 4:1-4 Now the angel who talked with me came back and wakened me, as a man who is wakened out of his sleep. And he said to me, "What do you see?" So I said, "I am looking, and there is a lampstand of solid gold with a bowl on top of it, and on the stand seven lamps with seven pipes to the seven lamps. Two olive trees are by it, one at the right of the bowl and the other at its left." So I answered and spoke to the angel who talked with me, saying, "What are these, my lord?" Zechariah 4:11-14 "Then I answered and said to him, "What are these two olive trees--at the right of the lampstand and at its left?" And I further answered and said to him, "What are these two olive branches that drip into the receptacles of the two gold pipes from which the golden oil drains?" Then he answered me and said, "Do you not know what these are?" And I said, "No, my lord." So he said, "These are the two anointed ones, who stand beside the Lord of the whole earth." 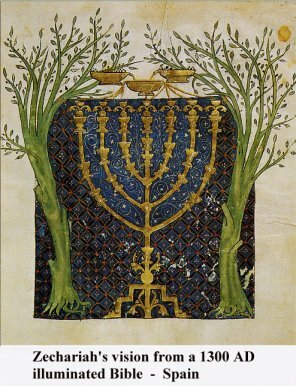 These are the two anointed ones, that represent the olive trees whose branches which send the oil that burns in the heavenly menorah and yet are two menorah's of Light themselves. At the time of Zechariah's prophecy Israel had been released from Babylon but the temple had not been rebuilt yet. Zechariah 1:16 “Therefore thus says the Lord: "I am returning to Jerusalem with mercy; My house shall be built in it," says the Lord of hosts, "And a surveyor's line shall be stretched out over Jerusalem." Zechariah 2:1-2 “Then I raised my eyes and looked, and behold, a man with a measuring line in his hand. So I said, "Where are you going?" And he said to me, "to measure Jerusalem, to see what is its width and what is its length." How would this relate to what John saw in Revelation? In both these sections of Scripture, preceding the two lampstands/two olive trees/two witnesses... There was “measuring” taking place. In both cases, measuring was being done to prepare for a temple. Zerubbabel had laid the foundation of a temple in Zechariah's time and the Lord was calling for it to be rebuilt. During John's lifetime, the temple of Jerusalem had been destroyed 70 AD (and as of this writing in September 2015, has yet to be rebuilt). What was always in a temple of God? In both heaven and earth are menorahs (or lampstands)... Jesus said in the "messages to the seven churches" (in Revelation 1:12-13,17-20,2:1) that He walks among the lampstands in heaven. In the tabernacle of Moses and in the temples of Jerusalem, there was always a menorah burning 24-7 in the Holy of Holies. We know from the book of Hebrews the earthly temple set-up is a reflection of the heavenly one (Hebrews 8:5). We also know that a temple is yet to be rebuilt at the time of this writing, but it is coming. In order for the abomination of desolation, to be set up and the sacrifices stopped, it has to have been rebuilt prior to the rapture and for a certain amount of time. Daniel 12:11 "And from the time that the daily sacrifice is taken away, and the abomination of desolation is set up, there shall be one thousand two hundred and ninety days." 1260 days is 42 months or 3 ½ years. So 1290 days is: the time of the first half of the 7 years plus 30 days. From this we can see, that the temple must be rebuilt and the sacrifices started again 30 days prior to the beginning of the 7 years. We do not know how long it will take to get the temple rebuilt and situated before the sacrifices are started again... but we do know that the sacrifices will be being offered again for 1290 days. So the temple will be rebuilt and sacrifices already restarted for 30 days. We also the Two Witnesses come on the scene and that they will prophesy for 1260 days/the first half of the 7 years (we know it is "the first half" because the 2nd half is only a time of judgment and wrath- Revelation 11:3-4). We know that at the beginning of the 7 years, the Antichrist is given authority, a white horse, a bow and told to go conquer. Also at the same time, the Two Witnesses will be accomplishing their assignment. Herein lies a clash of good versus evil. Lets break this down a little. They are God's Two Witnesses. And they have God-given power. They witness and prophesy. God established both the Jews and the Law (Torah). The Lord required two honest, witnesses to be brought with any important charges against someone. In any case involving the death penalty, 2 witnesses were required. If a witness was found to be lying, they had to suffer the equivalent punishment of whoever they bore false testimony against. Could it be that judgment is about to come on the earth and before it does, the Two Witnesses are part of that plan? For certain there is no question about it. Interestingly, the Greek word for “witnesses” here is “marturions” and is where we get the word “martyr” from in English. The Disciples were called “witnesses” by Jesus Christ Himself as recorded by Luke in the book of Acts. Acts 1:7-8 “And He said to them, "It is not for you to know times or seasons which the Father has put in His own authority. But you shall receive power when the Holy Spirit has come upon you; and you shall be witnesses to Me in Jerusalem, and in all Judea and Samaria, and to the end of the earth." To “give testimony” or “be a witness,” meant you would put your life on your word. These Two “Witnesses” of the Lord in the book of Revelation, will not only “witness” as in “giving testimony of God”, but also “prophesy” and eventually do so “unto death” becoming - “martyrs.” Praise God, that after 3 ½ days, they will rise again! John records that upon their deaths, the (worldly) people will "celebrate and make merry" all over the earth. So how is it, that they are "witnesses of the Lord" who prophesy but also torment the lost people on earth? They have the power to burn and devour, killing their enemies. They have to power to call for drought during the days of their prophecies. They have the power to turn water into blood and to strike the earth with plagues. What we have here is the battle of good and evil like never before. The Antichrist will be given power for 42 months to have control over the earth. The Two Witnesses are sent for 42 months to spread the Gospel and stand for righteousness. Revelation 14:6-7 “Then I saw another angel flying in the midst of heaven, having the everlasting gospel to preach to those who dwell on the earth--to every nation, tribe, tongue, and people-- saying with a loud voice, "Fear God and give glory to Him, for the hour of His judgment has come; and worship Him who made heaven and earth, the sea and springs of water." Darkness not does not like the Light, it hates the Light. The people of this world, that will be accepting a false Messiah, a global leader that is being set up to be their “god”... will be choosing darkness. They will fall for this global leader that does "lying signs and wonders"... He will be a global leader who hates the Light and who blasphemes God. Like any politician, he will at first be likable and not show his true colors. Eventually, the true ugliness of him will come out and it will certainly be ugly. Their testimony is Jesus Christ and the Gospel. Just when Satan and his Antichrist think they have it all under control... Boom. This is also when the rapture happens! This is at the middle of the 7 years. Not only do the Two Witnesses ascend, but the graves open and yield up the remains of those who come with the Lord to get their incorruptible bodies and for those alive in the Lord on earth, who will ascend with them (1 Thessalonians 4:13-17). The Lord will separate/call out His sheep unto Himself and then send judgment and wrath on the most blasphemous and wicked people that ever lived. Here is a mystery and how it will unfold. "Wherever the body is, there the eagles will be gathered together." Please notice this sentence or phrase in the following sections of Scripture. Can you see the mystery becoming clear? Did you ever wonder about this verse? It is tucked in there almost seeming like a riddle. The Lord reveals His truth in His time. In the days of the writing of the New Testament, vultures were considered eagles. Where the Two Witnesses' dead remains will be, the eagles (vultures) will be gathered. Just when the Antichrist has declared himself god and all the wicked ones think that they are free from the Two Witnesses; just when they think they have the Christians crushed. When the false prophet has had the image of the beast set up and he orders all to worship the beast and take his mark... When all the wicked ones are thinking, “peace now” - oh, are they in for a surprise. Praise the Lord! Just like at the Cross; it looked "the worst" but in reality, it was the opposite. Our Lord was not defeated at all. He was accomplishing what He had come to do! And so it will be on this great day of the Lord! Hallelujah! Exploring the possibilities of who the Two Witnesses might be. For collective thought & study. Could 2 humans really fulfill their roles? What if they are two angels in human form?